Our aim is to inspire people to take action. We have had hundreds of people who have already pledged to take action, so please join them. Have a look at our map of events for this year and see is there is one near you. If not, then please organise your own. 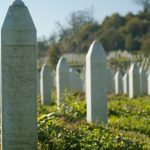 Get involved in educating people about Srebrenica. We have materials for teachers to download and presentations for use in community events. Get involved in working to build better communities.